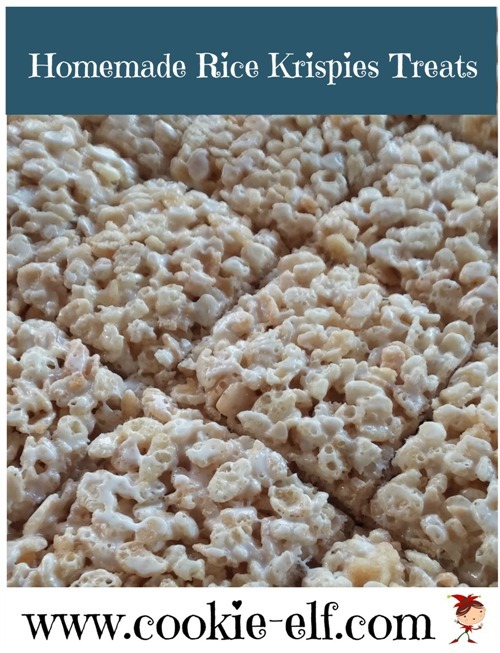 Homemade Rice Krispie Treats are the classic no-bake cookie recipe. The treats have become immensely popular not only because they are easy to make, but also because variations of the original recipe abound. And they're inexpensive to make. This original version is simple to make at home. With just three ingredients – crisp rice cereal, marshmallows, and melted butter or margarine – it is an easy cookie recipe for kids to make. As an added bonus, the bars are a gluten-free cookie! When the marshmallow mixture is ready, pour it into the rice cereal. Stir quickly, mixing thoroughly to coat the cereal. With a spatula or wet fingers, press cereal mixture in the prepared baking pan. Place a cutting board across the top of the baking pan. Flip pan over. Peel back the foil. Use a long bread knife to cut bars into 2-inch squares. Get more tips for making Rice Krispie Treats here.